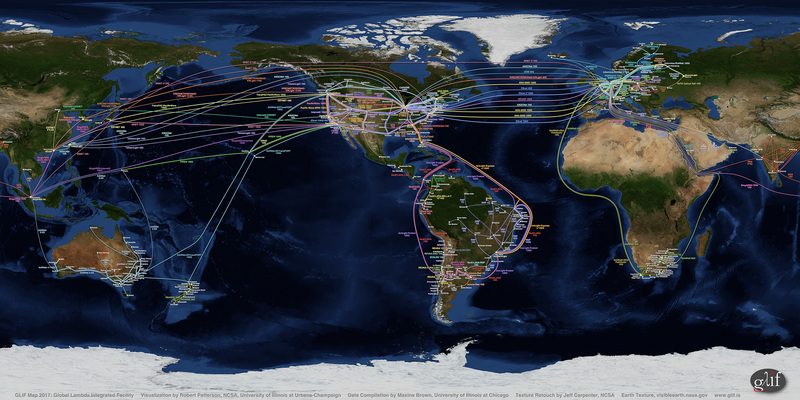 GLIF, the Global Lambda Integrated Facility, announces the availability of new world maps that showcase the global Research & Education multi-gigabit optical network infrastructure owned by its participating organizations. GLIF is a virtual organization (or facility) that consists of network providers, network engineers, computer scientists and computational scientists. The map features 60 participating networks representing 34 countries and multi-country organizations. GLIF itself owns no resources, so relies on its participants – from National Research & Education Networks, consortia, institutions and individual research initiatives – to share network resources, information and knowledge. In turn, this provides multidisciplinary research teams with shared cyberinfrastructure on which to cooperatively and collaboratively develop, test and implement new optical networking technologies, middleware and applications of global importance. GLIF organizations that provide bandwidth have capacity in excess of what is required for production usage, which they make available to global research teams, pending availability. 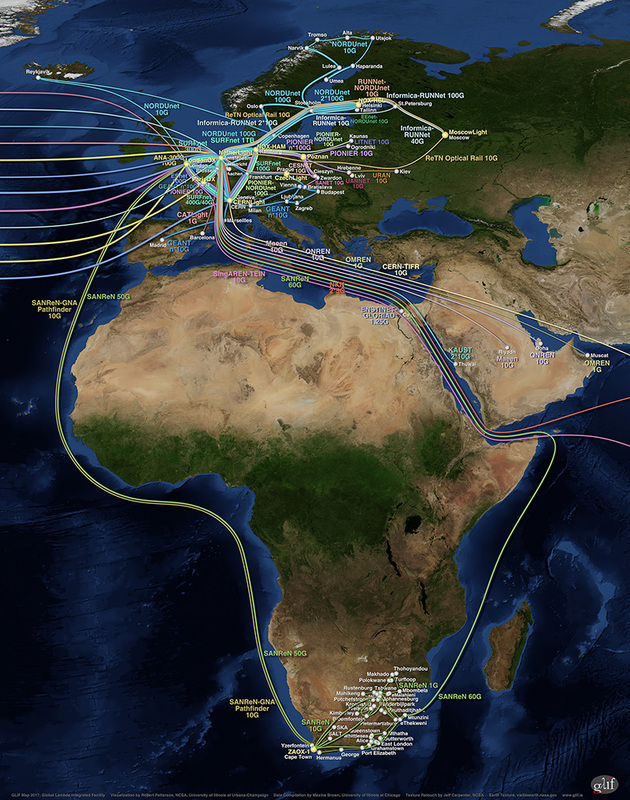 These optical networks interconnect and interoperate at GLIF Open Lightpath Exchanges (GOLEs) and Open Exchanges (OXs), creating a global advanced networking fabric that dynamically connects computing, storage, visualization, and instrumentation facilities at collaborating sites around the globe. Note: The GLIF map does not show international capacity dedicated to production usage. The GLIF Map 2017 visualization was created by Robert Patterson of the Advanced Visualization Laboratory (AVL) at the National Center for Supercomputing Applications (NCSA) at the University of Illinois at Urbana-Champaign (UIUC), using an Earth image provided by NASA with texture retouching by Jeff Carpenter, NCSA. Data was compiled by Maxine D. Brown of the Electronic Visualization Laboratory (EVL) at the University of Illinois at Chicago (UIC). Support was provided by GLIF, NCSA/UIUC, UIC, and the State of Illinois. For more information on GLIF, and to download the world and regional maps in a variety of formats and resolutions, see http://www.glif.is/publications/maps/.